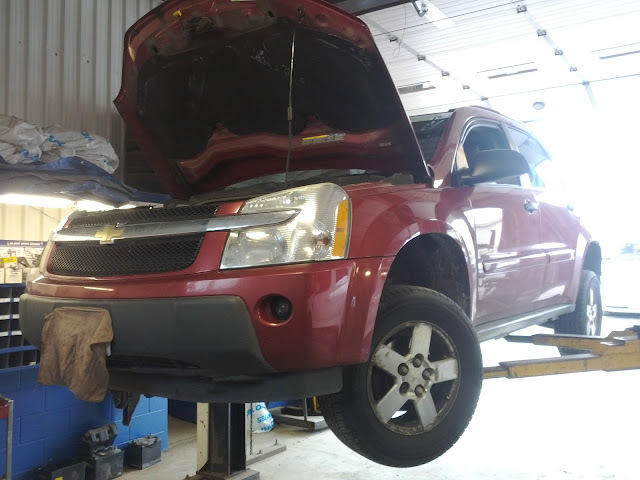 This is a 2005 Chevy Equinox, one of a trio of first-generation Theta platform mid-size crossovers that General Motors sold in North America, the others being the Saturn Vue and Pontiac Torrent. The Spring Hill, Tennessee-made Vue came first, introduced as a 2002 model, with the Ingersoll, Ontario-made Equinox and Torrent following in 2004. 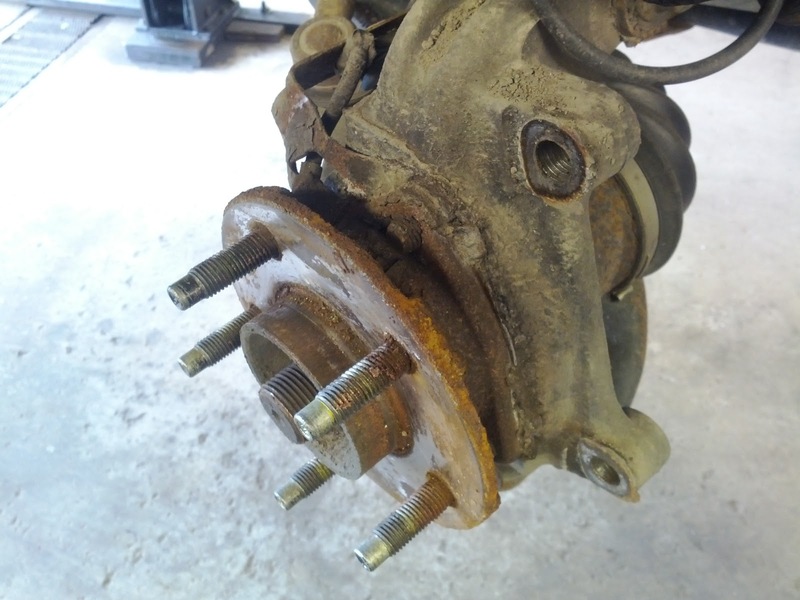 Seen below is the front hub assembly from the Equinox pictured above; a Torrent would be identical, a Vue similar. Incorporated into the hub is the front wheel bearing, which is a wear item, and a common failure part in many vehicles, though I can safely say that it's a particular weak spot in numerous GM vehicles. 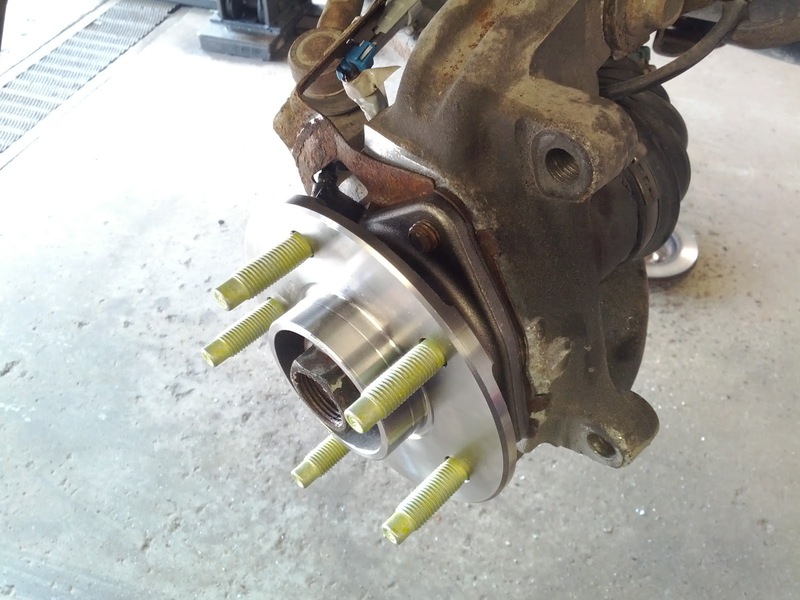 When the bearing portion of this part fails, it can result in excessive play, noise, or both. This one was noisy. So why is this worthy of a Jackass Award? Well, it's not for the failure rate, which, to be fair, may or may not be statistically significant - my sample area includes a higher than normal percentage of GM vehicles, after all. Not for using a hub design, which while more expensive to replace, is far, far easier to change than the press-fit wheel bearings frequently found in such applications. No, the Jackass Award goes to the engineering team for this part, who obviously felt that it was not only a good idea to fit a steel hub into an aluminum steering knuckle (steel and aluminum don't play well together, especially in the presence of salt), but to do so with NASA-level tolerances that made this part a tight fit even before the swelling effects of corrosion became a factor. The bolts are what actually hold the hub in place, and there are several other vehicles where there is clearance or even cutouts around their hubs, so this one-step-short-of-press-fit design was unnecessary. Forget using a slide hammer here, as that will just pull the flange out of the bearing. 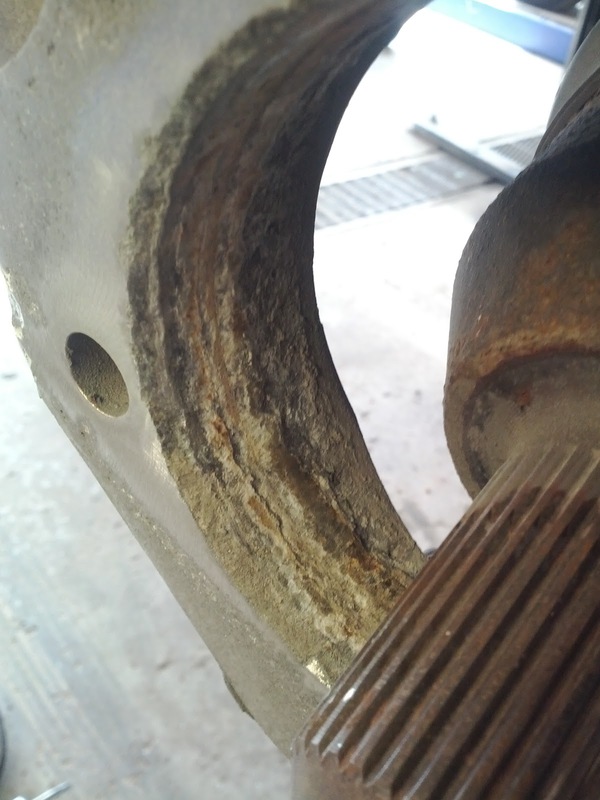 The most effective extraction method, short of removing the knuckle/upright and putting it in a press (which no sane mechanic would want to do), is to baseball-style swing a Bloody Big Hammer at the flange until the hub and knuckle declare defeat, or the mechanic passes out. 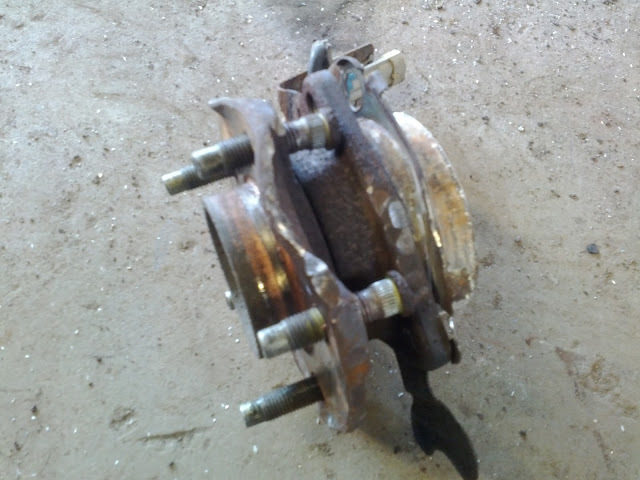 You can see what the hub looks like after 15 minutes of intermittent hammer swinging in the photo below. I did mention the aluminum knuckle, right? Be careful not to hit that with the BBH - it's not really forgiving if you hit it in the wrong places. It's not unusual for the sheetmetal dust shield to suffer during this process, either. If it isn't rotten already. Don't worry, the dealer stocks it; you won't be the first to kill one. Oddly, the nearly identical component set in a similarly-sized Chevy Uplander minivan does not suffer from the same problem. Yes, it fails regularly, and it does use an aluminum knuckle with a steel bearing, but it normally comes apart with little fuss. For designing a serviceable part in a manner that makes it far more difficult to actually service than it ever needed to be, while simultaneously failing to take into consideration the real-world environment that this product would face in its primary market, please accept a Jackass Award. A great example of Bonehead Engineering. ...and here's what the new unit looks like. I couldn't leave you hanging.